More than a week later, and we’re still digging out from the onslaught of iPhone games that we’ve learned about since the beginning of the month. Here’s a roundup of many of the recent releases that have crossed our desks. 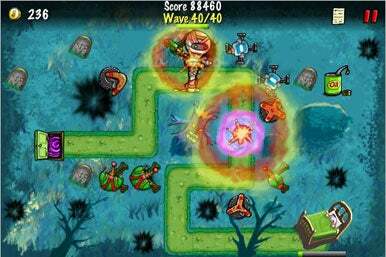 A new “tower defense”-style strategy game for the iPhone, The Creeps from Super Squawk Software has you build and upgrade defensive towers to destroy your enemies before they reach the end of a path. Defend yourself with toy blasters, glue bottles, flashlights and boomerangs, summon giant spiders, UFOs, slick the path with oil and more. There are 16 stages in two locations, and 10 unique creeps with bosses too. It costs $2, though there’s also a free lite version. In Zit Picker, Candywriter’s $1 game, Veronica is stressed out because her complexion is going crazy right before she’s supposed to be on TV. You can help her by bursting her zits—whiteheads, giant zits and painful zits. Do this while listening to "The Flight of the Bumblebee" by Rimsky-Korsakov. Crazy Drops is a $3 color-matching action puzzle game from Columbiamug similar to Candy Crisis, in which you must match unstable creatures of the same color to make them disappear. There are 12 increasingly difficult levels, Wi-Fi multiplayer support, and autosave if you need to take a phone call. Ever have fun as a kid playing with slot cars? Now you can relive the joy with SlotZ Racer from Freeverse. The game, first announced during Macworld Expo, is now available on the App Store for $3. You can race against the computer or up to three other friends on a single iPhone. You can also design courses using a built-in track editor. SGN has updated its popular (and free) iPhone game iBowl with new capabilities and features. iBowl now supports live challenges and network gaming. iBowl brings a Nintendo Wii-style game experience to the iPhone as you get your whole body into the effect, rolling a virtual bowling ball down the lanes. Securicy Ventures, the maker of The Safe, has released The Bomb, a $1 game in which you must disarm a bomb that can explode at any time. More zombies! Trapped: Undead Infection has you stuck in a bio-research lab with hordes of the undead, hungry for your quivering flesh. Com2us’ game costs $2. Ian Dunlop tells me that before he got into iPhone development he was working on an original game for the Nintendo Wii—an idea that didn’t get funded, so he wasn’t able to complete it. But he’s considering it for the iPhone and wants to know what people think. It’s called RetroShooter 2050 and it’s billed as a "simple point-and- shoot game with a twist." The twist is tht each level represents a decade in history starting with the 1940s and ending in 2050. You can check it out at his Web site, and drop him a line and let him know how you feel. Brain Surge has been out for a bit, but HotGen just got around to telling us about it now. It’s a brain training game for the iPhone for $3. Dr. Fergus challenges you to visual, computing, memory and logical puzzles. It has support for one to four players. In Escape from Nuclear Nova Software, you use bombs, teleporting pads, push blocks, dodge shooters and guards, and more. You have to escape from 60 levels. The game costs $3. Megatouch Monkey Bash, a $1 game from Megatouch, has you smacking at circus monkeys as hard as you can, sending them sailing across the big top and bouncing on trampolines, up ramps and off banana peels. A new strategy board game from Felipe Oliveira, Hex Territory pits you against the “iPhone’s Artificial Intelligence” as you prevent it from taking over your territory on a gameboard comprising hexagons. It costs $1.